Diamond Platnumz's mother Bi Sandra has finally recognized her third grandchild born by Tanzanian model Hamisa Mobetto. Bi Sandra has for long refused to acknowledge his son's relationship with Mobetto, prompting Diamond to make a public plea for her 'to love all her grandkids equally'. And during her birthday party, the grandmother of three was recorded on video saying, "Si Dylan ni mume wangu?" Her family that was gathered for the cake cutting ceremony clapped in celebration. Bi Sandra then proceeded to cut and eat Dylan's cake that had been delivered to her on her birthday. Sandra loves posting videos and photos of her other two grandchildren Tiffa and Nillan born by socialite Zari Hassan. She has been criticized for ignoring Dylan and never sharing his photos on her accounts. It took the intervention of her son Diamond for her to finally accept the son he bore with Mobetto. "Katika Kusheherekea siku yako hii kuu ya kuzaliwa, ningeomba Pia, kama Unipendavyo Mwanao pia Uwapende wajukuu zako wote, kwani ni wadogo na Hawana hatia wala hawajui chochote... Na wakukwazapo Wazazi wao Wakuwahukumu wao hata wakitumia ngao ya watoto kukukwaza... Mama angu kipenzi familia nilokuletea Mwanao ni @deedaylan @princess_tiffah @princenillan , hao ndio familia yako tokea kwangu, na siku nikioa huyo ndio atakuwa mwengine kwenye Famiia," he wrote in part. 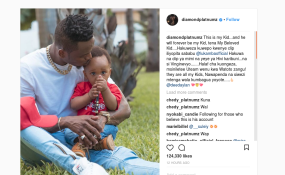 Diamond in his post asked his fans to stop taking sides when it comes to his three children, saying they were all his and that no one should victimize Mobetto's son. Diamond's fans have lauded his mother's decision to publicly accept her third grandchild despite the frosty relationship between her and Mobetto.